In the second of a series, Sophie Chappell and Lachlan Guertin go behind the scenes at some of our favourite TV shows. It’s where Australia goes every Monday night to clear the air – and sometime to muddy the waters. And with a range of major events happening in the days prior – the ABC in shambles and the public humiliation of an American judge among them – it was a great week to be part of a taping of the ABC’s flagship Monday night debate program. Though the arguing was mild, the experience was eye-opening. Arriving at the ABC Southbank studios, audience members pass through a security check, locks their bags in a cage and is directed to their assigned seats. Before the show begins, there is an unexpected touch to keep the audience entertained and enthused: a musician performs acoustic hits from Michael Jackson, Amy Winehouse and the Arctic Monkeys by the side of the stage. The music adds a colourful background as the crowd settles in – indeed, the live music and the appearance of a “hype man” it could easily be mistaken for the taping of a light-hearted chat show rather than a serious forum for political debate. The hype man walks around the studio talking to various audience members and assigns the role of “clapping captain” and “woo girl” to select people, and as a group we practice our applause and reactions. The hype man jokes about potentially losing his job at the struggling ABC, pokes fun at a crying child in the audience – “Who brings a baby to Q&A?” he wonders – and introduces the host, Tony Jones, to the stage. Along with Jones comes executive producer Peter McEvoy, who acknowledges the traditional owners of the land before reading out tweets from a few people attending the show and identifying those who will be asking questions – including checking the pronunciation of their names and making sure they have their questions printed out on the card they were given earlier. The panelists for this show: Trade Minister Simon Birmingham, Labor’s Amanda Rishworth, singer-songwriter John Butler, South Australian Greens Senator Sarah Hanson-Young and People’s Panellist Sali Miftari. As they are brought to the stage they are met with applause, with Butler the clear crowd favourite. Before the show airs, the audience is told to hush as a preview of the show is recorded. Then there is a countdown to let everyone know when we will be on the air – and soon enough Q&A is live across Australia. As predicted, the show is controversial, exciting and powerful. It is interesting to see up close the audience reaction to the panellists’ comments – including a few snickers here and there for Birmingham, and much laughter for some of John Butler’s comments. There are questions about youth suicide, the Brett Kavanaugh Supreme Court nomination and turmoil at the ABC. The most interesting moment, however, is when former Monash University Melis Layik student describes having meat thrown at her by a group of young men who invaded her room at 3am because she was vegan. The #MeToo movement also features, with Hanson-Young vocal about her experiences. She is also there to promote her book En Garde, in which she discusses the difficulties she faced after Senator David Leyonhjelm said that she should “stop shagging men” back in July. The experience overall is unique. 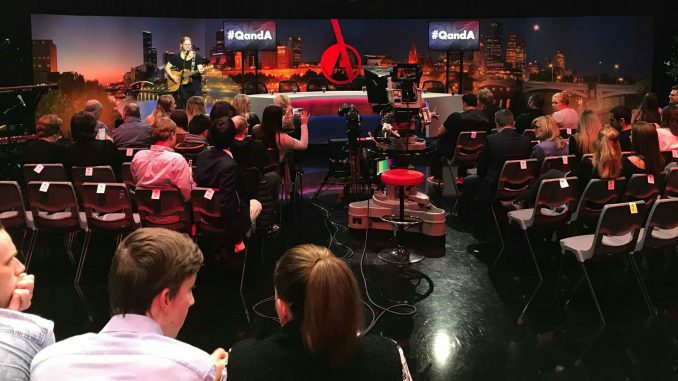 If you’re interested in debating, laughing at politicians and having an overall fun night out, being a Q&A audience member should be on your bucket list.